LuxCamp welcomes you to Camping Park Garda! Camping Park Garda is located directly on Lake Garda, where it has its own private beach. Here you can practice various water sports, such as windsurfing or sailing. A boat trip on Lake Garda is highly recommended. For water fun you can also visit the luxurious camping site itself. On site you will find a beautiful swimming pool with a special children's pool. Book your mobile home now at this Luxcamp campsite! 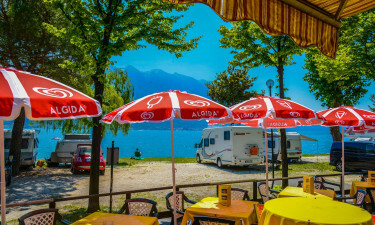 Why luxury camping at Camping Park Garda? Beautifully situated on Lake Garda, in a shady spot amidst the olive trees. This campsite is a must for water sports enthusiasts. You can practice various water sports such as windsurfing or sailing. Various boat trips on Lake Garda are also possible. By boat taxi you can be taken to the other side of Lake Garda. Beautiful pool with special children's pool for hours of swimming fun. The campsite offers the perfect base to discover the surroundings of Lake Garda. The picturesque Italian village of Limone sul Garda is only 1.5 km from the campsite. After an exhausting day trip you can cool down in the pool. From your mobile home you can immediately splash into the pool. The spacious pool offers the possibility to swim several lengths. The adjacent children's pool is perfect for the little ones. Here they can play safely with the water. At the edge of the pool are sunbeds and parasols. Would you rather swim in Lake Garda? The campsite has its own private beach. This slowly sloping pebble beach is ideal for families with small children. The campsite also has various sports facilities such as table tennis and bicycle rental. Don't feel like cooking during your holiday? The campsite with luxury facilities has a restaurant, bar, grill on the beach and pizzeria. You can enjoy a delicious fish dish or pizza with a view of the mountains and Lake Garda. It is also possible to take your meals to the mobile home. For your daily shopping you can go to the mini market on the campsite. This luxurious camping site of Luxcamp offers all the ingredients for a wonderful family holiday!